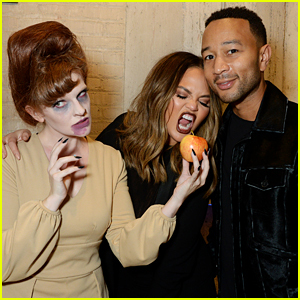 Chrissy Teigen and John Legend are getting into the Halloween spirit! The cute couple stepped out to help kick off Creep LA: Awake over the weekend in Downtown Los Angeles. 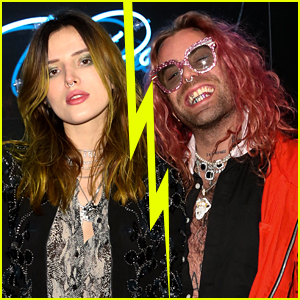 The duo were joined for the spooky show by tons of other celebrities including Anna Kendrick, Brittany Snow, Taylor Lautner, Lance Bass and Nolan Gould. Creep LA: Awake is a multi-sensory 75-minute walk-through experience filled with terrifying scenarios, moody rooms and intimate encounters. Sounds like the perfect Halloween activity! The event takes place at ROW DTLA and runs Thursday to Sunday until November 4th. Kathy Griffin arrives in style for Equality California’s 2018 Los Angeles Equality Awards at JW Marriott Los Angeles on Saturday night (September 29) in Los Angeles. The comedian was honored that evening with the Ally Leadership Award at the special event. Also seen at the event were Lance Bass with hubby Michael Turchin, as well as Queer Eye‘s Karamo Brown. The Queer Eye cast received the Equality Visibility Award at the event. If you don’t know, Kathy was mentioned in the SNL cold open last night featuring Matt Damon as Supreme Court Justice nominee Brett Kavanaugh. “I’m here because of a sham perpetrated by the Clintons, George Soros, Kathy Griffin, the gay mafia and Mr. Ronan Sinatra,” Matt said while parodying Kavanaugh’s testimony this week. “I couldn’t be happier. I’ve always wanted to be part of the deep state which includes the Clintons and George Soros,” Kathy wrote in reaction to her mention. 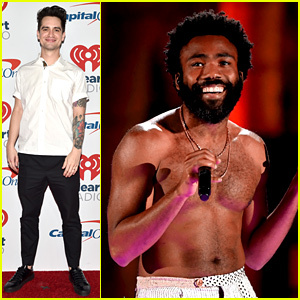 Childish Gambino (aka Donald Glover) goes shirtless while performing for the crowd at night one of the 2018 iHeartRadio Music Festival on Friday (September 21) at the T-Mobile Arena in Las Vegas. More of the performers that day included Brendon Urie and his band Panic at the Disco, Stevie Nicks with Fleetwood Mac, Jack White, and Jason Aldean, among others. A bunch of celebs showed up to the event as presenters, including Ryan Seacrest, Iggy Azalea, Paula Abdul, Jana Kramer, Lance Bass, and sisters Erin and Sara Foster. You can see all of the pics of these stars in the gallery. Stay tuned for more photos from day two of the festival! Chrissy Teigen & John Legend Help 'Queer Eye' Guys Celebrate Their Emmy Noms! 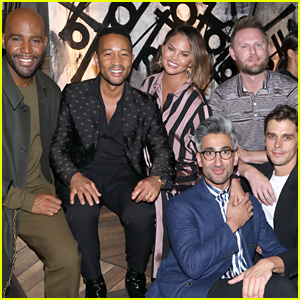 Chrissy Teigen and John Legend pose with the guys from Queer Eye while attending an event to celebrate the cast’s Emmy nominations on Saturday (September 8) at the Kimpton La Peer Hotel in West Hollywood, Calif.
Antoni Porowski, Tan France, Jonathan Van Ness, Karamo Brown, and Bobby Berk were all at the event, hosted by Ketel One Family-Made Vodka, ahead of the Emmys. Netflix’s Queer Eye reboot is nominated for three awards – Outstanding Structured Reality Program, Outstanding Casting for a Reality Program, and Outstanding Cinematography for a Reality Program. 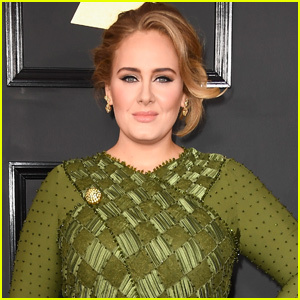 Also in attendance at the event were engaged couple Meghan Trainor and Daryl Sabara, Lance Bass with husband Michael Turchin, and Nate Berkus with husband Jeremiah Brent. “I have no voice today. I am so happy to have met these wonderful humans yesterday. I feel like I’ve met friends for life. My groomsmen in my next wedding for sure,” Chrissy wrote on Instagram. FYI: Meghan is wearing Sydney Evan jewelry. Jamie Foxx shows off his shades while hosting the Prive Revaux Investor Closing Party at Club James on Thursday evening (August 23) in Beverly Hills, Calif. The 50-year-old actor was joined at the event by Privé Revaux Eyewear founder David Schottenstein and brand partner Dave Osokow, as well as Snoop Dogg, Jeezy, Lance Bass and Ryan Rottman as they toasted to the brand’s success and picked out their favorite Privé Revaux frames. It was recently announced that Fox has given a third season order to Jamie‘s hit game show Beat Shazam, according to Variety. 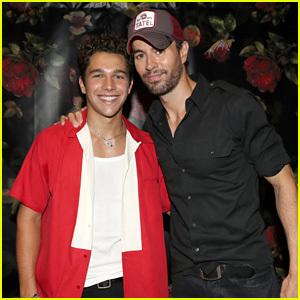 Enrique Iglesias & Austin Mahone Perform at Private Party in Texas! Enrique Iglesias and Austin Mahone pose for a photo while attending the 25th Anniversary of law firm Thomas J. Henry Attorneys in San Antonio, Tex. this past weekend. The guys performed at the event alongside other musical acts like The Chainsmokers, Lil Jon, and Maroon 5. Some of the other celeb guests included Lance Bass and husband Michael Turchin, George Lopez, Shanina Shaik, and more. Thomas‘ family – wife Azteca, daughter Maya, and son Thomas Jr. – were all in attendance as well for the lavish event, produced by celebrity production designer Dylan Marer.